The Herring Gull (Larus argentatus) can be recognized by its silver-grey back and it’s pink legs. 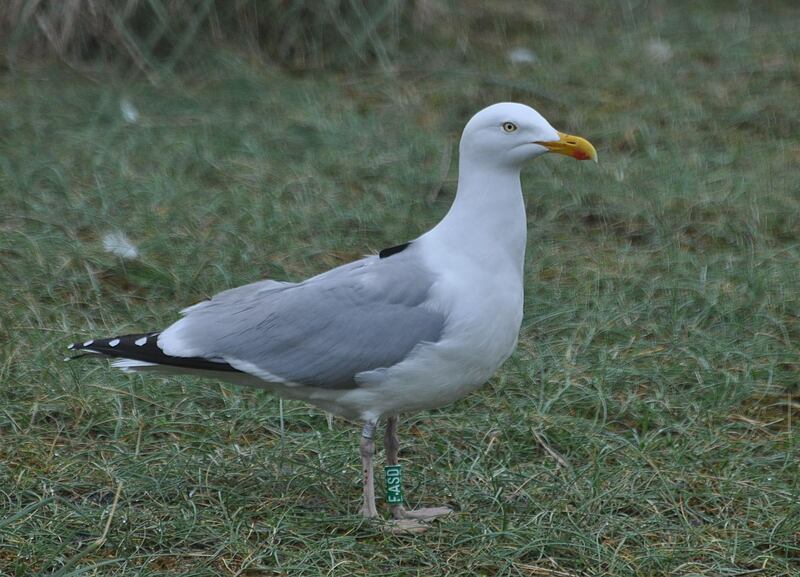 It is slightly larger than the Lesser Black-backed Gull (Larus fuscus). It breeds predominantly in coastal dune areas but more recently it can be found breeding in industrial areas and on rooftops in cities. The herring gull does not migrate in the winter but usually disperses away from the breeding colony over distances of several hundreds of kilometres. Based on colour-ring resightings, the Dutch population spends its winter in the southern half of The Netherlands, in Belgium and northern France. Herring Gulls are omnivorous, but the Wadden Sea populations eat predominantly bivalves and crabs, supplemented with (discarded) fish, mammals, birds, insects, and human refuse. The Herring Gull population in The Netherlands, at odds with common beliefs, is currently in decline. Breeding numbers peaked in the 1980s at ca. 90,000 pairs, but are currently at 46,000 pairs and declining. In the United Kingdom, a similar decline led to inclusion of this species on the Red List. Within The Netherlands, however, despite this poorly understood and major decline, Herring Gulls are actively persecuted in urban areas where they are considered a nuisance. Recent studies of Herring Gulls in the Wadden Sea area showed that the breeding success is currently moderately high, but that the declining trends is most likely caused by low levels of immature and adult survival in wintering areas.